As proclaimed by the Svacchanda Tantra, “No Knowledge exceeds Sanskrit Alphabet”. The source of the Aksara can be traced the Vedas. Every Civilization has its own theories of Creation describing the origin of the cosmos in their own unique way which are symbolic narrative of a culture, tradition or people. The different thoughts of Indian philosophy like the Vedas, Upanisads, Purānas and Tantras put forward varied versions of the genesis of creation. According to the Vedic hymns, the source of the creation is interpreted differently; a hymn of the Veda says that the process of creation is both monistic and monotheistic as it is either God created the world out of His own nature without any pre-existent matter or through His power acting on externally pre-existent matter. The monistic conception of creation says the Absolute Consciousness (Purusa or Brahman) which is the only one existing and the first fact of affirmation of the primal “I”, through tapas, active Purusa or Brahman and passive Prakrti or Vāc, are the formative principle and the chaotic matter. The rest of the evolution follows from the interaction or the desire, kāma between these two principles. The vāc here becomes important as she is the source of the cosmic sound from which arise all the other sounds. The Rg veda says “I (Vāc) make him whom I love formidable, him a Brāhmana, him a Rsi, him a Sage.” The Rsis called their hymns a manifestation of Vāc. Vāc is imperishable, the first-born, Mother of the Vedas, the centre-point of immortality and is verily Saraswatī the counterpart of the creator Brahman. Vāc meaning “to speak” is both voice and the word it utters known as Śabda, Artha or object and Pratyaya, the mental apprehension. The Vāc has four stages before it is manifested or heard. The Para- Vāc is the causal stress which is the Cosmic Ideation (Srsti-kalpana) of Brahman is also the divine “Word”. The Paśyanti Vāc is Vāc producing or manifesting as Sūksma, Madhyamā- Vāc is the Matrkā state of Śabda and Varnas are the spoken speech known as Vaikharī – Vāc. Brahman created everything by uttering the words first and the objects corresponding to them followed, uttering “Bhūh” he created the earth and so forth, the whole creation meaning that the different worlds and manifestations were created by the word. “Vāc” the “Word” as the Srsti says, “Four are the steps of Vāc, three being hidden in the cave do not issue, the fourth is spoken by men in their speech.” The four stages of speech begin with the Śabda-brahman, the unmanifest sound which appears as the Kundalinī-Śakti. The origins of the kundalinī is of cosmogonic notions (the cosmic serpent), as a conception of the body as a replica of the cosmic pattern. The kundalinī has an essential symbolic role as energy in both macrocosm and microcosm and corresponds between the human and the cosmic levels. The awakening of this energy is on two levels, one on the cosmic and the other on the human. The string of alphabets, from A to Ksa which are the Mātrkās, “is eternal, unbeginning and unending, and Brahman itself”; this great saying is the gist of all Tantras. To quote a few Tantras, the Śaradātilaka Tantra says that the Śabdabrahman exists in all things as consciousness and Kundalinī, appears as letters in prose, poetry, and so forth, being carried by air to the throat, palate, teeth and other places. The Kāmadhenu Tantra declares that the Mātrkāśakti consisting of fifty letters, from A to Kśa, is the seed of all moving and non-moving. It continues to say that it is true and certain that supreme Kulakundalinī Herself, who is the fifty letters, from A to Kśa, has given birth to this entire universe, consisting of moving and non-moving things. Thus, the Tantras find the knowledge of the letters as the central quest and the decoding of these unveils the secrets of the cosmos. The letters of the alphabet in Sanskrit are known as ‘Aksara’ meaning imperishable. These alphabets fifty in number beginning from “A” and ending with “Ksa” are called as “Varnamālā” which litereally means “garland of letters’. The total number of alphabets is fifty or fifty- one. As Sir John Woodroffe says, these letters together are called ‘Aksamālā’ as the garland of letters begin from ‘A’ and end with ‘Ksa’ and the two together i.e. the first letter and the last letter become ‘Aksa’ to which when the word garland is added becomes ‘Aksamālā’. These letters form the basic expression of the Sanskrit language. The fifty primary sounds which constitute the vehicle of the Mother Kundalinī are called Varnas, because they are coloured. They are of various colours like red, white, blue, melted gold, coral, electric light and other colours and hues. They are called Aksaras, because they are imperishable and form the body of the universal Mother. They are called Matrkās as from them the whole universe of forms, visible and invisible, terrestrial and celestial, has sprung into being. The Kāmadhenu Tantra proclaims that the written letters of the alphabets from A to Ksa are composed of the Bindu, Mātra , and Rekhā which are all really Brahman, and the presiding deities of these lines and points are identified with Brahmā, Visnu, Maheśvara, Śakti, Sūrya and Ganeśa. 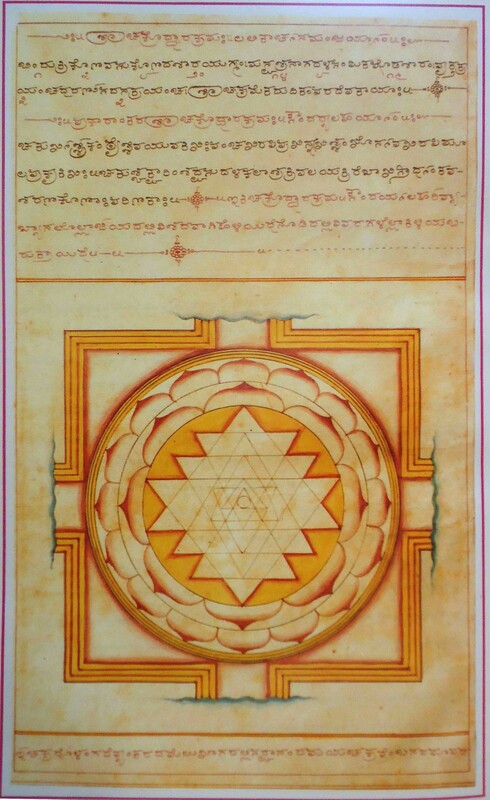 It is further described by Sir John Woodroffe that the writing in the ordinary use known as Aksara is nothing but the Yantra of the Aksara Brahman. Aksaras are Yantras made of resplendent linear forms and represent different Mātrkā Śaktis. The Aksaras according to the Daksināmūrti Samhitā elaborates that the letters are divided into seven or eight groups and each one of the groups has its own presiding goddess as Mātrkā and in this way came into existence the cult of the Sapta Mātrkā (seven Mothers) and Ashta Mātrkā (eight Mothers). There are particular deities presiding over the groups like Mahālaksmī for the group ‘A’ or ‘Avarga, Brāhmī for the group of ‘Ka’ or ‘Kavarga’, Maheśvarī for ‘Ca’ or ‘Cavarga’, Kaumārī of ‘Ta’ group i.e. ‘Tavarga’, Vaisnavī for ‘Ta’ or ‘Tavarga’, Vārāhī for the group ‘Pa’ or ‘Pavarga’, Indrānī for ‘Ya’ Group ‘Yavarga’ and Camunda for ‘Sha’ group or ‘Shavarga’. Apart from the deities of the groups of letters, the letter is considered to be by itself an illuminous source of life which is the sound body of a separate Śakti. Each of the letters represents a Śakti. The name of the Śakti begins with the letter she symbolizes which is mentioned here along with the letter. The Śakti of the letters are Amrtā, Ākarsinī, Indrānī, Isānī, Umā, Ūrdhvakeśinī, Ekapadinī, Aiśvarī, Omkārinī, Auśadhātmikā, Ambikā, Aksarātmikā, Kālarātrī, Khatitatā, Gāyatrī, Ghantādhārinī, Ňanrātmikā, Candā, Cchāyā, Jayā, Jhankārinī, Jnanarupā, Tańkahastā, Thamkārinī, Dāmarī, Dhamkārinī, Nāmini, Tāmasī, Thāminī, Dāksāyanī, Dhātrī, Nandā, Pārvatī, Phatkārinī, Bhandhinī, Bhadrakālī, Mahāmāyā, Yasasvinī, Raktā, Lambostikā, Varadā, Śaśinī, Sarasvatī, Hamsavatī and Kśamavatī. However the names of the Śaktis of the goddess are only forty six and not fifty here and each text mentions different number of letters and different names of the Śaktis. 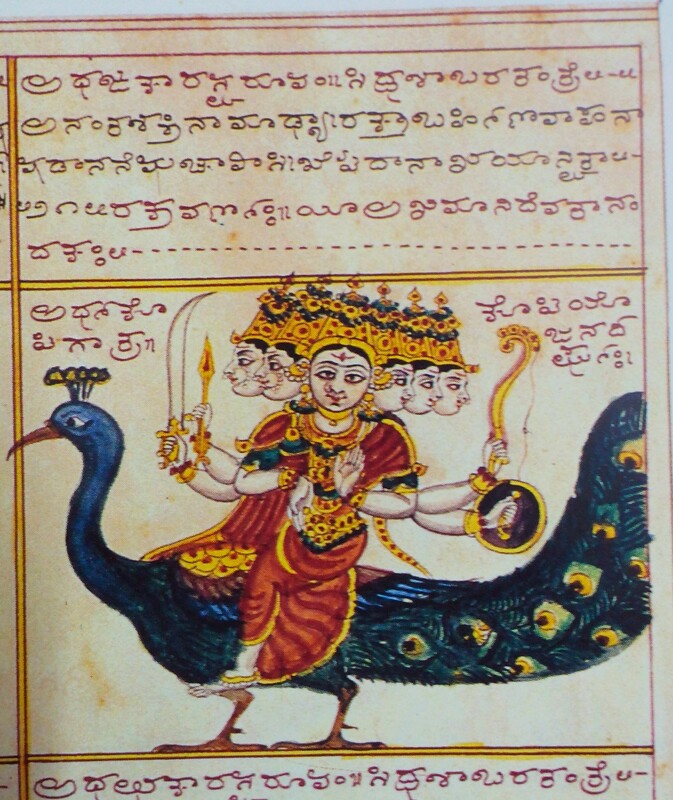 Amongst such texts is Śrītattva-Nidhi, a unique text which is an illustrated manuscript depicting the goddesses of the Sanskrit alphabets in the traditional Mysore style of painting. The illustrated manuscript tradition of India owes its origin to the rich tradition of mural paintings of Ajanta, from the Palas of the western India in the late tenth century and the Jaina illustrated manuscripts like ‘Kalpasūtra’ between the 12th and the 14th centuries. In the South India, the counterpart of the Jaina illustrated manuscript painting appears in the 12th century under the Hoysala dynasty and Dhavala manuscripts produced at the Jaina centre, Sravanabelogala. The Hindu versions of the illustrated manuscripts are seen after the fall of the Vjayanagara empire. After the fall of the Vijayanagara Empire in 1565 AD, Mysore and Tanjore became great cultural centres where traditional painting of the Vijayanagara School was given a fresh lease of life. Raja Wodeyar (1578 – 1677 AC) the ruler of Mysore encouraged the artists by building a temple of Nimishamba Devi at Śrirangapattana, the tutelary deity of the painters belonging to the Kshatriya Raju community. It was His Highness Sri Mummadi Krishnaraja Wodeyar of Mysore (1794 – 1868), who was a renowned scholar and poet in Sanskrit, Kannada, Marathi and Persian languages. He embellished the walls and ceilings of temples with paintings; he got a large number of icons of metal and stone prepared for worship and thus employed several artists and craftsmen. The paintings of his period present a wide variety ranging from murals depicting the Hindu Panteon and Purānic and mythological scenes to portraits of Mysore rulers. Along with his contribution to art, architecture and literature, his Śrītattva-Nidhi is an illustrated manuscript, which is a synthesis of scholarly interpretation complemented with relevant paintings. He appointed highly competent artists like Javagallu Narasimharayya, Virana, Pappanna and Tanjavoor Kondayya to whom he described the gods and goddesses with minute details before they started the paintings. The Śrītattva-Nidhi as the name suggests is rightly a treasure of the knowledge of the different aspects of ancient Indian thought of which the Śakti- Nidhi is one of the volumes which translates the letters into visual forms of the Goddesses. The Śrītattva-Nidhi, a pictorial digest of nine volumes, encyclopedic in character furnishes information from the Vedas, Āgamas, Tantras, Pūrānas, Dharma Śāstra, Itihāsa, Mantra Śāstra, Jyotiśa and Śilpa. The work is written in calligraphic Kannada script, but the language is Sanskrit. 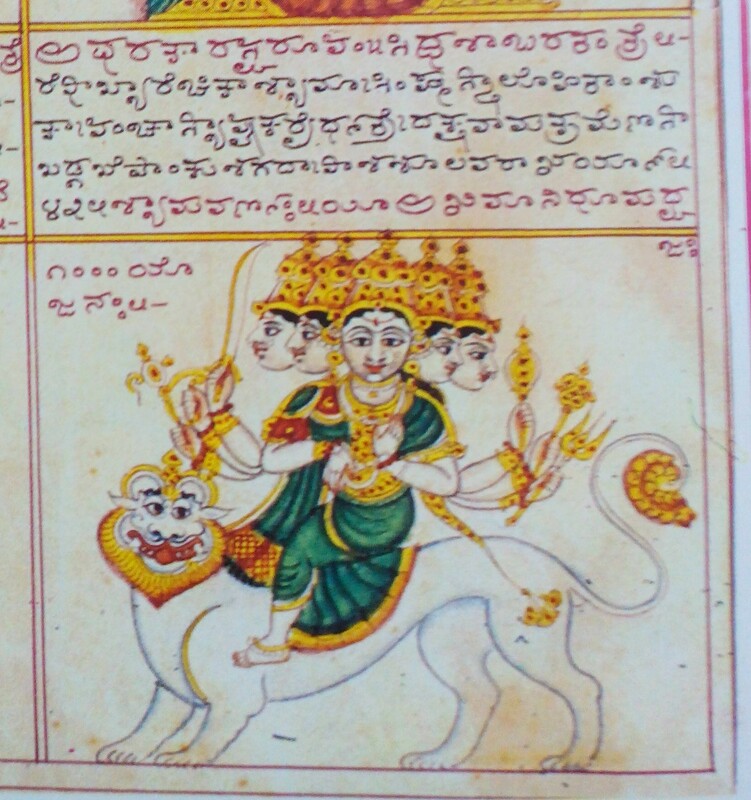 The first volume of the Śrītattva-Nidhi is the Śakti Nidhi named after Śakti, an epithet of the goddess Cāmundā, the family goddess of the royal family of Wodeyars. The Śakti Nidhi delineates the various icons of the Mother goddess as the cosmic force and the source of the world. The manuscript measures 15 inches by 11.5 inches with 578 folios with a broad orange border and an inner yellow line with one thousand and three verses about different Goddesses with elaborate descriptions of the ornaments they wear, the weapons they carry and the musical instruments they play. It enumerates the iconography of various deities like Ganeśa, Cāmundā, Mahālaksmī, the deities of the Śrīpura, along with the presiding goddesses of each of the letters beginning from ‘A’ to ‘Ksa’. 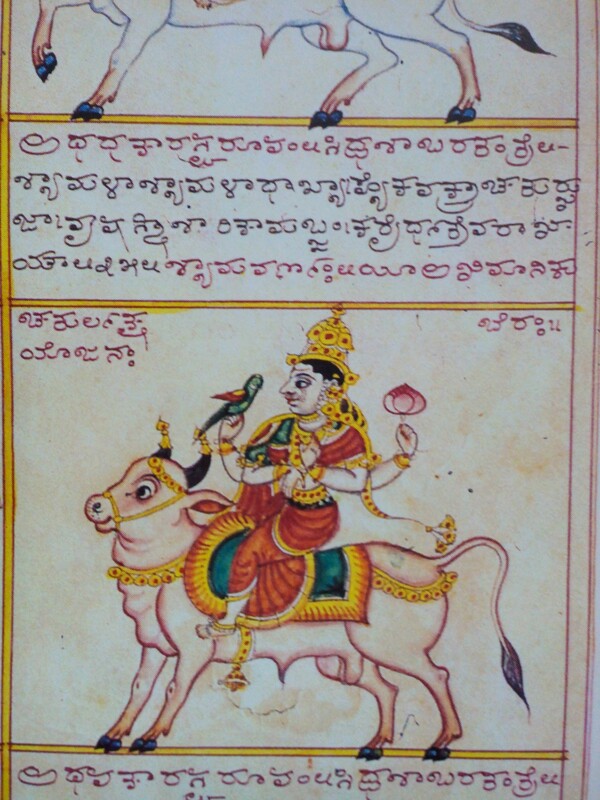 The Manuscript consists of one hundred and six paintings of the deities in characteristic Mysore style of painting. Ananda Coomaraswamy established the aesthetic and formal approach to Indian art, its objectives and spiritual greatness through the idealistic and symbolic basis of Indian cultural heritage. He asserted that Indian murals and pictorials are not mere illustrative materials of Indian religious, myths and legends of the iconography of gods and goddesses but they generate emotions and feelings and human sensibilities regarding space, rhythm, balance, volume, grace and emotions of form and their differentiation. The Śakti Nidhi follows as an example of an artistic rendering of space, colour and form at the same time exhibits the grace of the deities in fine painting. It describes the Lalitopākhyāna as a dialogue between Sage Agastya and Hayagrīva detailing the secrets of the Śrīcakra (fig 1) as the king of Cakras, with nine coverings and the different goddesses residing in them. The Aksara goddesses preside over the seventh chakra called the Sarvākarsakara. The queen of this chakra is Siddha and the goddesses residing here are called as the Rahasyayoginīs who are the presiding deities of speech (vāgadhīśvarā) including the fifty aksaras. The forms of the letters from A to Ksa are as mentioned in the Siddhaśābara Tantra. The goddess represented by the letter ‘S’ is Siddhikriya. She resides in a white lotus. She is reddish brown and carries in her hands a lotus and the gestures of wisdom, granting gifts and fearlessness. (fig 2 ) The goddess represented by ‘R’ is Recika. She is blue and seated on a lion. Her robes are red. She has five faces. In her eight hands she carries a sword, a shield, a hook, a mace, a noose, a spear and gestures of granting wishes and fearlessness (fig 3). Goddess Shyamala, who is dark brown in colour, is represented by the letter ‘Dh’ . She has one face and four hands. (fig 4) She is seated on a bull and carries in her hands a female parrot, a lotus and the gestures of granting wishes and fearlessness. 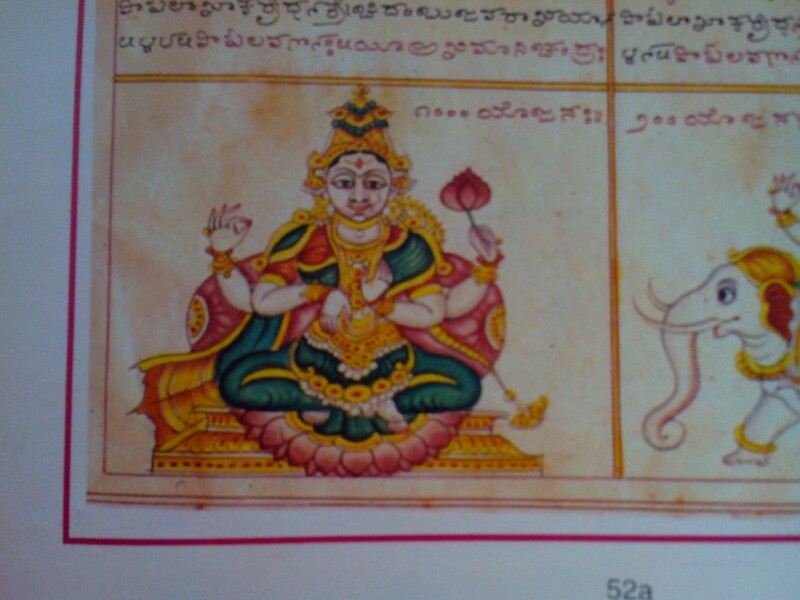 Goddess of the letter ‘N’ called Anantashakti (fig 5), she is seated on an elephant in rut, and has one face. She is yellowish white resembling the lightning. In her hands she has two lotuses and the gestures of granting wishes and fearlessness. The forms of the goddesses have a stylistic representation irrespective of the different descriptions given in the verses written in exquisite calligraphy, the faces look similar, the postures shown are either sitting in a padmāsana or seated on the animals. The garments worn are a sari and a blouse which is mostly green or red in color. The arms and hands are identical but the weapons held are different like the conch, bow and arrow, mace and sword according to the attributes of the goddesses. The animal and bird vehicles like elephant, tiger, lion, peacock, swan and horse finds an exceptional illustration. The paintings of the Aksara goddesses are unique in concept, style and representation. The forms of the Goddesses are graceful with expressive gestures. The colours are fresh and the pallet is basically primary colours with green and little of brown used for emphasizing the outlines. However the usage of gold foil is one of the salient features of Mysore style of painting and is missing in these paintings may be to suit the manuscript type of presentation. The faces of the goddesses have defined features with a predominant expression which is either a frontal imagery or a profile one. The jewelry and the weapons attributed to each of the goddesses show meticulous details and the fall of the garment, though repetitive, creates interest in its own way. The intricate brush strokes and the delicate outlines which flow in a single steady line form the uniqueness of the Mysore style exhibited in these paintings to its excellence. 15. Matrkā, which is an adjective derived from Mother, means the letters of the alphabet. 19. headline; and Rekhā are the lines forming the line itself.